viaLibri ~ Right of Way and Track Map of Salinas, Monterey County, California. Southern Pacific Lines (San Francisco, Calif.). Right of Way and Track Map of Salinas, Monterey County, California. San Francisco, Calif.: Southern Pacific Company, [n.d.] - Blueline print, 24 x 56 inches. 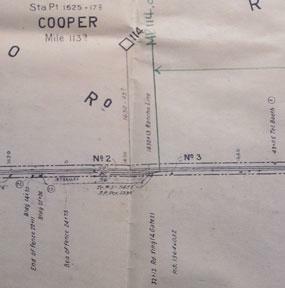 Yard and switching limits indicated in black and green pencil. From Bolsa de Scorpinas to Rincon del Sanjon Racho. Includes Station Point Cooper, Bolsa del Potrero y Morocojo. No structures shown. With Schedule of Property listing 3 transfers, 1872. Scale: 1 inch = 400 feet.